It’s beneficial, at times, to change one’s perspective, even turn one’s world upside down! Such an opportunity came about last week being one of four people invited to be a guest writer at the Stratton Vermont Wanderlust festival. The festival was at once fun, and very moving. Wanderlust festivals are held throughout the summer; next week in Aspen-Snowmass, CO, then Squaw Valley, CA, Whistler, BC, CA, and Tremblant, QC, CA. There is still time to sign up! Farm to table food and wine events, top name entertainment, and world class yoga instruction offered in breathtaking venues are common to all festivals. Approached with the proper attitude, the experience of attending one of these festivals can be literally life changing. Please take a few moments to read the following stories; they may have been motivated while being on a different mountain, but should resonate with us folks here on “The Hill”. 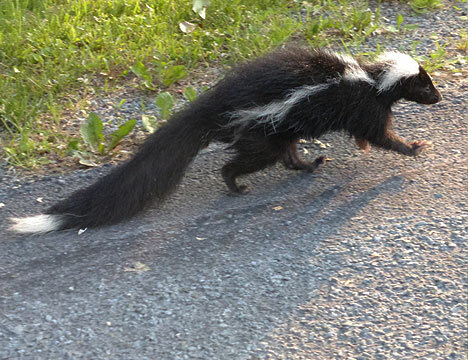 This young fellow was jogging along the side of the road last evening – looking for mama no doubt. A four mile drive through the neighborhood caused us to come across the obligatory turkey buzzard, cattle, deer and rabbit enjoying their evening meals. For the second time this week, our progress was delayed by a snapping turtle crossing the road, following his internal compass to destination unknown. Yes, mid-summer is a wonderful time of the year; nearly all of the resident critters here on the hill are out and about, enjoying the bounty of the season! Recently, a friend who I haven’t seen for a while, and I hiked up The Hill together. A misty day, damp, humid; no chance for a view once on top. Yet, we continued, the grass soaking the bottom of our trousers, wicking the dampness of the trail up our legs, our path littered with hundreds of salamanders, also known as red-efts, or newts. “500” my friend remarked, as having been the most he had ever counted on a hike. “I’m sure we’ve seen more than that today.”, before we had even reached the top. Each of us took care not to tread on any of the orange creatures that had become too numerous to count. 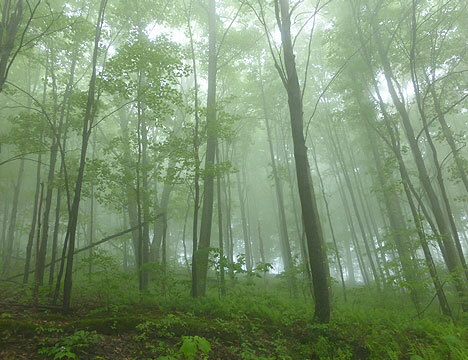 Our conversation meandered as we walked, he under the weight of a recent loss of a loved one. We spoke of his family; how close he had been to the family member who had passed. He told stories of his children, and their adventures and accomplishments on far away mountains in the Rockies, Canada, Russia, and beyond. I listened as we walked, offering comfort as I could, and genuinely appreciating his tales of other hikes in other places, with other folks. Hiking in the mist, with few landmarks, absorbed in conversation, we were almost disoriented as the top of the mountain seemed to come much more quickly than usual. “Home, sweet home.” I said as we reached the top – a place that both of us have been many hundreds of times, during all seasons of the year. We looked out into the mist, a wall of gray, knowing from memory what the expanse beyond looked like. mountain; some have died. There are the ashes of many beings, some human, sprinkled here and there on this mountain. Growing up, I kissed girls on the mountain. At least one friend proposed marriage on the mountain. Some friends admit with a wink that their children were made when they found themselves alone while hiking here. Having reached the age that joints are more painful from rest than activity, I try to hike as much as I can to avoid the pain and immobility of body parts that are worn and torn. I am not alone. Other dear friends hike for the same reason, and to ameliorate the symptoms of other diseases. Another friend, having lost members of his family on the mountain, hikes nearly every day he’s home as it makes him “feel closer to his family”. Certainly, if one spends enough time in any place, memories of these life events accumulate. It is a blessing, however, that for those of us who frequent The Hill, our reference place for these events comes with an abundance of gravity for physical exertion, and kindred souls whose company nurtures us, comforts us. While driving over to meet some neighbors last evening, it was easy to notice that the hills now sport every depth and shade of green we get around here. If one looks closely, the tops of the highest hills still reflect the pale green of very early Spring; the pines on the slopes and valleys show the deepest, richest green of the year. There has been more observable change in the last two weeks than in the last two months. For weeks on end after the ski season, the cold kept everything at bay. Nothing seemed to be growing; not the grass, not the buds, nothing. Then, in the space of one week everything seemed to burst forward at once. One day the grass didn’t need to be cut, two days later, it was already too long. 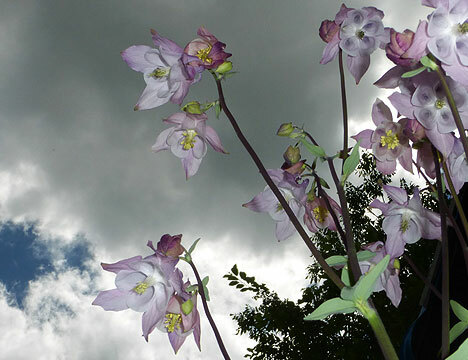 Columbine and Phlox, invisible seemingly days ago, have become tall, leggy and prominent. The grape, apple and pear buds that kept themselves tightly wound, steeled against the cold weather, have unwrapped, flowered; some have begun to show the infant fruit that will continue to grow for the next several weeks. While chatting with the neighbors, a glance past the deck showed that there was just enough of a breath in the twilight to softly disrupt the surface of Lake Alice so it was no longer mirrorlike. Rather than reflecting a perfect image of the surrounding hills, the lake surface canvassed an impressionistic interpretation of the evening scenery every bit as compelling as a Monet or Renoir.